Bluetooth and six-speaker audio system with built-in satellite and HD radio. As with many Porsche models, the car can be completely customized with numerous add-ons. The power-folding soft top can easily be lowered in less than nine seconds with the engine running. In case of rain, the top can be raised while going up to a speed of 31 mph. 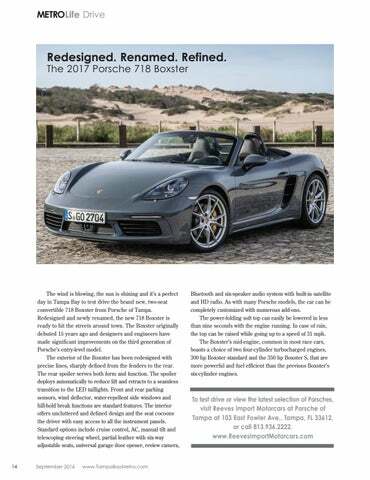 The Boxster’s mid-engine, common in most race cars, boasts a choice of two four-cylinder turbocharged engines, 300 hp Boxster standard and the 350 hp Boxster S, that are more powerful and fuel efficient than the previous Boxster’s six-cylinder engines.